In stem cell implantation, a patient's own stem cells are harvested from their bone marrow and then injected or implanted into a damaged joint. This treatment helps the damaged joint heal more effectively, preserving tissues that might otherwise sustain further damage. Because stem cell implantation can promote the healing of a damaged joint, effective treatment can reduce or even entirely eliminate the need for surgery. Stem cells are a kind of cell called an undifferentiated cell. When a cell is undifferentiated, it means it can turn into almost any other kind of cell in the body. Depending on what kinds of chemical signals they're exposed to, stem cells can become immune system cells, bone cells, muscle cells, and other kinds of cells. 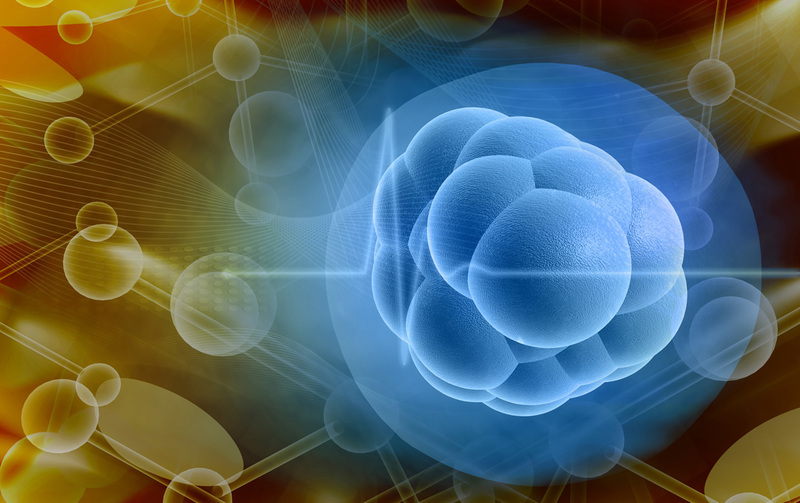 Another characteristic of stem cells is that they can divide indefinitely, meaning that one stem cell can generate a virtually infinite number of new cells. These characteristics of stem cells mean that they have the potential to be useful in a wide range of medical treatments. One way in which stem cells are being used is to heal and restore damaged joints. Stem cells are located in moderate numbers in many of the body's tissues. In the event of an injury, stem cells in the injured area activate and differentiate into cells that are then integrated into the damaged tissue as it heals. However, the body can't always supply enough stem cells for an adequate level of healing. This is especially true as we get older, or in the event of a severe injury or progressive damage caused by a degenerative disease. These problems can be addressed with stem cell implantation, which supplies the injured area with a large number of stem cells. The aim of stem cell treatment is to supply a damaged joint with a larger number of stem cells than the body is able to supply by natural means. In stem cell implantation, a patient's stem cells are harvested from a bone marrow sample drawn from one of the body's large bones. The stem cells may be treated in a laboratory to increase their number or make them more potent. Then the cells are injected into the area being treated, in this case a hip or knee joint. In some cases, the cells are surgically implanted into the joint. Whether the cells are implanted or injected depends on the nature of the injury and where it's located. If the damaged part of the joint can't be easily accessed with a needle, then it might be necessary to surgically implant the cells. There are few risks associated with stem cell transplantation, because the cells that are implanted into the joint are harvested from your own bone marrow. This means there's no risk of contracting an infectious disease from the bone marrow, or of your body rejecting the transplanted cells. However, most people do experience some mild side effects after having a stem cell transplant. For instance, it's common to have some discomfort in the treatment area for a few days. What Results can You Expect from Stem Cell Transplantation? Most people have good results with this treatment. A typical result is to have a significant reduction in pain in the affected joint within 1 to 2 months after the treatment, with continuing improvement for several more months. However, a small number of people do find that they don't get much benefit from stem cell transplantation, so it's important to have realistic expectations when you have this treatment. As well as this, because stem cell transplantation is a relatively new treatment, there is as yet little known about how long you can expect the results to last.